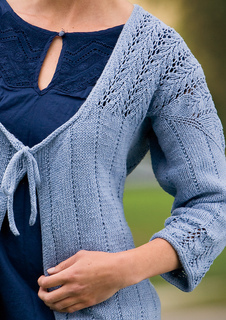 A lovely openwork-topped cardigan featuring three-quarter sleeves edged with lace, a graceful tie closure, and gentle waist shaping. 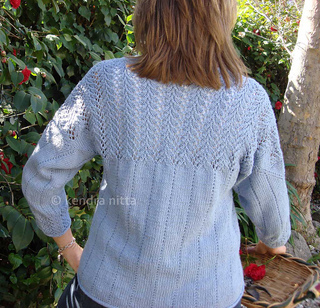 Originally published in February 2009 in The Smart Knitter newsletter, this completely revised pattern corrects the errors in the original pattern, and contains additional instructions, new charts, and new photos. Inspired by Elizabeth Zimmermann’s “nalgar” increases from Knitting Workshop, this seamless sweater is worked from the bottom up and requires little finishing. 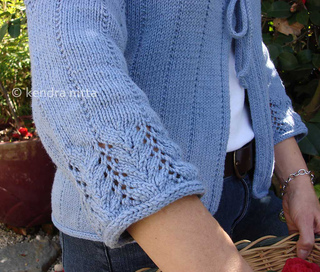 The stitch patterns flatter any figure, with faux-ribbing that doesn’t cling and draws the eye upwards to fern lace spilling over the shoulders. A classic spring and summer accessory for a light dress or jeans. 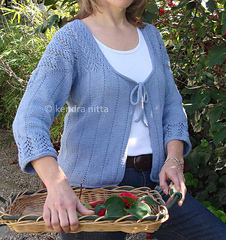 Pattern trade-in program: If you currently have the original version of this pattern fromThe Smart Knitter, please email your copy of the pattern to missknitta@gmail.com and I will send you a coupon for the new version.